If you have a broken spring – chances are the door will only go up part of the way and will look like this. Unless you have a ‘Wayne Dalton Torquemaster’ spring – in which case you won’t be able to see it. We also replace those systems for less than they themselves will replace their springs. They charge less than $20 for the spring, plus $269.00 (+ tax), the last I checked. We will replace that system with a normal spring system that every other door uses for $255 including tax. We do not replace your springs with springs that are “close to right”. We install the correct spring and spring size on your door every time, and will show you how you will know. 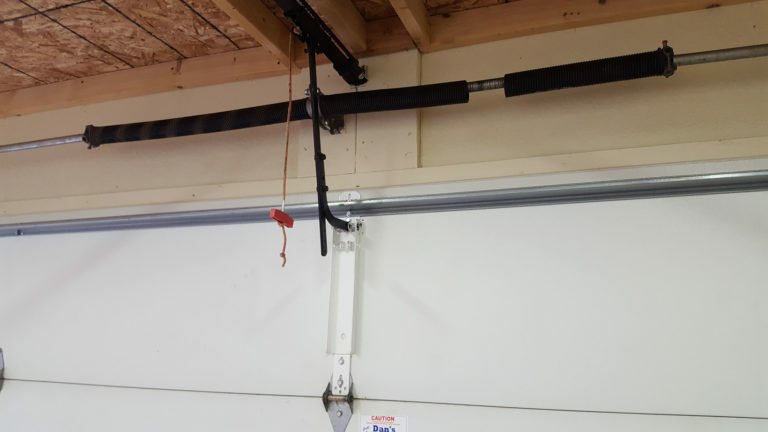 Double spring replacement is usually $199 for 16×7 doors. Single spring replacement is $139 and we get to you fast. We know how frustrating it is to have a non working door!